Tuesday: Email from Threadless. Your T-shirt has shipped! 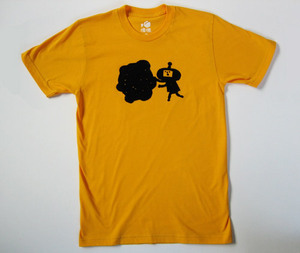 Wed: Lovely new Katamari T-shirts available from Panic (see above). Saturday: Email from Panic. Katamari shirt in the post! Sunday: Temperature plummets. Light Hail. Tuesday (AM): Spent the morning looking ruefully at new Threadless t-shirt, before covering it with many layers of jumper. Tuesday (PM): Blog about lovely new Katamari shirt. Fear it won’t see daylight til June.